The Pixma MX455 is an inkjet all in one, that prides itself with some very modern features and targets the large and choosy home and small office market. It aims to do this with the usual mix of good Canon print quality and cost effectiveness. This all in one comes with a good quality printer in both monochrome and colour outputs, the enhanced print resolution of 4800 dpi helping matters. The photocopies are a bit disbanded but otherwise good quality. The scanner has a maximum resolution of 2400 x 4800 dpi, but then the scan output, though overall good, looks a little edgy. The printer comes with only 2 ink tanks, one black and another colour, thus replacing Canon Pixma MX455 Ink Cartridges can be a bit wasteful, as even if the ink in the colour cartridge is remaining for the other two colours, one has to replace the complete cartridge. Pixma MX455 has some really good connectivity options, other than the usual WiFi and USB, one can also print directly from mobile phones using the Bluetooth connectivity. Surprisingly the front USB only allows one to download scans and not use it for printing directly. The printer has 2 print trays, with the main 100 sheet feeder tray, and a smaller 20 sheet for special paper sizes. Another good feature is the availability of both standard and high yield Canon Pixma MX455 Ink Cartridges, giving heavy users a way to reduce their printing bills. The slow speeds of 9.7 ppm in monochrome and 5.5 ppm in colour limit heavy usage. The dimensions of the printer are compact, though once opened it does carry a bit more desk space. The lack of ethernet is also surprising, as most other connectivity options are present. It also has an application for iOS and Android through which one can directly print from mobile phones. 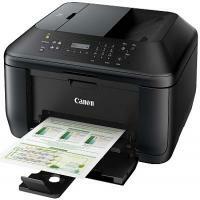 Canon Pixma MX455 is a good all rounder, with very good quality colour printouts. The wide connectivity options, high yield cartridges, make it a good workhorse, though it is a bit limited with its small sized input tray. Overall, for its low cost and large features, it is a good option for most homes and small offices. What are the Regular Maintenance Procedures to be followed for better quality results from the printer? Step 1: Before performing any maintenance procedure check the ink status in the Canon Pixma MX455 ink cartridges with the LCD on the printer machine. Step 2: If your print results are blurred and colours are not printed correctly, the print head nozzle is probably clogged. Check the print head nozzle condition by printing the nozzle check pattern. Clean the printheads if there are some missing patterns in nozzle check print pattern. Step 3: If the printed ruled lines are misaligned or print results are otherwise unsatisfactory, follow the steps to align the printhead in order to improve the quality. What steps to be followed for Print Head Nozzle check pattern? Step 1: Load the A4 size plain paper and open the paper output tray. Step 2: Press the setup button. Select the maintenance option and then press the OK button. Step 3: Select the nozzle check option and press the OK button. The pattern will be printed. Step 4: Now if you observe any missing, faint or horizontal streaks in the pattern then again go for print head cleaning. Step 5: Again in the maintenance option, select cleaning by using arrow keys and press on OK button. Wait for the cleaning process to be completed and then again check the nozzle pattern. If the problem persists then confirm the ink levels of Canon Pixma MX455 ink cartridges and the printheads. How to do Print Head Alignment? Step 2: Extend the paper guides. Gently slide one guide to the A4 mark. Step 3: Slide the right paper guide and as you slide the right paper guide the left one slides automatically. Step 4: Use the appropriate paper type. Align the cut edge to the right front corner. Step 5: Adjust the guides to align the paper. Step 6: Put the lower cassette back. Step 7: Open the output tray and the support. When the message appears head alignment required press the Ok button. Step 8: The printhead alignment takes six minutes. After the pattern is printed print head alignment is completed. Q. My printer usage is extremely heavy and hence the ink runs out very quickly. Do you provide any Canon Pixma MX455 ink cartridges that last longer? A. Yes, we provide high capacity ink cartridges called PG540XL (Black) and CL541XL (Colour) compatible with the Canon Pixma MX455 printer. They last longer than PG540 and CL541 ink cartridges. Q. What is the optical scanning resolution of Canon Pixma MX455? A. Canon Pixma MX455 has an optical scanning resolution of 1200 x 2400 dpi (dots per inch). Q. Can I take prints directly from my iPhone 7 using the Canon Pixma MX455 printer? A. Yes, you can take prints from your iPhone 7. Direct printing using Apple’s AirPrint is supported for iOS 4.2 or later versions. You can print from other apple devices too. AirPrint can be used to print directly from an iPad (iOS 4.2 or later), iPhone (3GS or later), or iPod touch. Q. What are the dimensions of Canon Pixma MX455 and how much does it weigh? A. The approximate dimensions of this printer are: 458 mm (Width) x 385 (Depth) x 200 mm (Height). It weighs around 8.4 kg. Q. How does the use of compatible Canon Pixma MX455 ink cartridges help the environment? A. Our compatible cartridges are made from recycled cartridges that have been used previously, resulting in very little usage of new materials or components. This helps in conservation of the environment. Q. What is the input tray capacity of the Canon Pixma MX455 printer? A. The input tray of Canon Pixma MX455 has a maximum capacity of 100 sheets of plain paper. Q. What is the difference between a toner and an ink cartridge? A. Toner cartridges are filled with powder that may include polymer, wax, carbon powder, resin, etc. Toner cartridges are used in laser printers while the ink cartridges are used in inkjet printers like Canon Pixma MX455 and are filled with liquid ink. Q. Do you offer any discount if I purchase the compatible Canon Pixma MX455 Ink Cartridges in bulk from this site? A. The Canon Pixma MX455 printer is suitable for bulk printing projects. Buying the compatible Canon Pixma MX455 ink cartridges in bulk would be very economical. This way you can have a stock of the required ink. This will also reduce your overall printing expenses. The ink cartridges can last up to 6 months before they start to dry out. Keeping them sealed in a cool and dry place will prevent them from drying out and you could stock up in bulk easily. Also, if you are ordering for the first time from our site, you'll get additional 5% off on your first purchase. Q. Does this printer offer Ethernet connectivity option? A. Unfortunately, the Canon Pixma MX455 lacks in providing ethernet connectivity. Also, it does not support automatic duplex printing. Q. I have ordered the wrong cartridges for my Canon Pixma MX455 printer. How can I return the non-faulty items back? A. We would definitely like to help you out with the returns for any wrong purchase. Please return an item in its original and undamaged packaging with all of its components within 7 days of cancellation. If an item is returned undamaged in its original packaging and is fit for resale, then, we will offer you a refund in accordance with our refund policy and you can place your order for the new Canon Pixma MX455 ink cartridges that are compatible with your printer. If you do not return the item within 7 days of cancellation of the product, we will make a charge in respect of the cost of recovering the item. Q. Do you offer an extra charge for submitting an item? A. Yes, the return of the non-faulty goods is subject to the customer paying for the transportation cost of the items back to the warehouse. Q. I am an accountant by profession and I need to print 100-150 pages daily. Is Canon Pixma MX455 a good affordable option to buy? Will I get the same quality of printouts if I use non genuine compatible cartridges for this printer? A. The Canon Pixma MX455 is a perfect blend of good quality output and cost effectiveness. This compact design fits best on the office desk and have convenient connectivity options of Wifi and Bluetooth connectivity so it can accordingly serve all your purpose. Using compatible Canon Pixma MX455 ink cartridges available on our website will give you the best quality and affordable results. Q. Does Canon Pixma MX455 uses FINE cartridges? What does it mean? Are the more expensive and do you have compatible cartridges for this printer? A. Yes Canon Pixma MX455 uses FINE cartridges which are nothing but cartridges with the mechanical printheads rather than the printer. In this case, the printer has two ink cartridges one is black and other is tri colour installed and dispatches ink directly onto the paper. They are priced like the usual cartridges. Yes, we offer compatible Canon Pixma MX455 ink cartridges which yield high-quality output. Q. I am getting error message E,4 over the LCD screen of my Canon Pixma MX455 printer. What does it mean? A. It means that your Canon Pixma MX455 ink cartridges are out of ink and you need to replace them. Check for the compatible Canon Pixma MX455 ink cartridges that are available on our website. The printer Canon Pixma MX455 printer is using the fine cartridge which has printheads over them. Please do not touch the printheads or the electrical contact over them. Follow the below steps to replace the cartridges. Turn on the power and open the front cover followed by the paper output tray. Open the paper output cover. The head cover opens automatically when the cartridge holder moves to replacement position do not touch or hold the cartridge holder until it stops completely. Remove the empty cartridge by pushing the ink cartridge lock lever until it clicks. Install a new cartridge without shaking it after removing its protective tape. Gently insert it straight into the holder until it touches the back. Lock the cartridge into the place by pushing up the ink cartridge lock lever. Q. I am using Canon Pixma MX455 and I want to print in black and white only. How can I do that? Can I use black ink in both the cartridges? In the Printing Preferences menu select the Main tab and choose the settings. You can also select print options during the print process. From the Print Dialog, pop-up menu selects the Quality & Media tab and check Grayscale Printing checkbox. Please do not use black ink in both the cartridges for the proper functioning of the printer. Although the printouts are monochrome the printer will use the combination of colour inks. Q. My printer Canon Pixma MX455 sounds like it's printing but there is not output on the paper. I have recently changed the ink cartridges and I am sure that they are not running out of ink. A. If you have encountered this problem immediately after installing new cartridges then you must check whether the cartridges are installed properly. Also, check if you have inserted the compatible Canon Pixma MX455 ink cartridges. There might be a possibility that your printer requires a nozzle cleaning process. Print the nozzle check pattern by following guidelines from the manual that has come along the printer. If the pattern is broken or has white space then go for cartridge cleaning to unclog the nozzles by following below steps. Press Menu button repeatedly until MAINTENANCE option appears. Q. Does your website provide cartridges for Canon Pixma MX455? The black cartridge runs out of ink often. Do you have any packs that have more of black ink? A. Yes, we do provide original as well as compatible Canon Pixma MX455 ink cartridges. We sell cartridges for this printer in black and colour cartridge 2 pack. If you run out of black ink cartridge often then you can separately buy the black ink premium cartridge because as for now we do not offer any packs that have more of black ink.